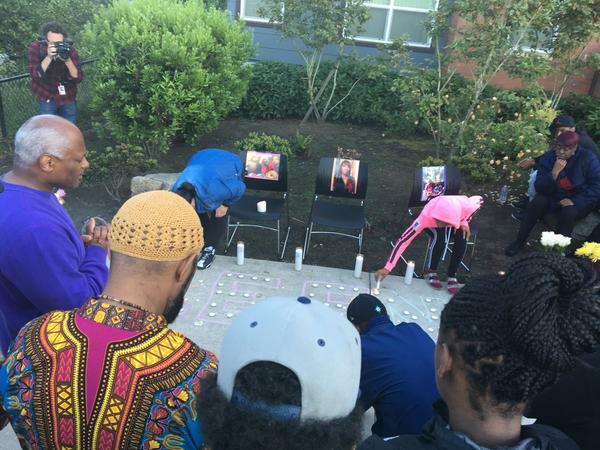 Friends, family and activists gathered for a vigil Sunday outside the apartment building where Charleena Lyles was killed earlier that day. - Lyles, 30, was African-American. - The two officers were white. They have not been publicly identified. - Lyles had been arrested two weeks earlier at her house after she threatened other officers with scissors. - Because of the previous incident, police considered her an "officer hazard," which is why two officers were dispatched to take her burglary report. - At least two of her children were at home during the shooting. One child can be heard crying in the background during Sunday's incident. - Police said Lyles was armed with one or more kitchen knives, but they have not said whether she directly threatened the officers. On the scratchy dash cam audio released Monday, the two officers can be heard preparing for the call by discussing the previous police call to her house. An arrest report for the June 5 encounter describes Lyles as speaking bizarrely about wanting to "morph into a wolf," about the officers being devils and also members of the Ku Klux Klan. During that incident, the report says she threatened officers with a large pair of scissors, saying, "Ain't none of y'all leaving here today!" The officers drew their firearms, but the report says they eventually talked her into dropping the scissors. But the encounter on Sunday ended with gunfire. The police may have had less warning, the second time around. According to the dash cam audio, they seemed to be having a normal conversation with her, as she tells them about what's been stolen — she confirms a missing Xbox. Then there's a four-second pause, followed by a sudden commotion — you can hear Lyles say, 'You ready? ', she calls them an expletive, and the cops react, saying "We need help," presumably over their radios, and commanding someone to "get back." This commotion lasts 16 seconds, and then they fire the gunshots that kill her. Investigators are likely to look closely at whether the officers could have done more to de-escalate the situation. As part of a federal consent decree, the Seattle Police Department has emphasized training in "crisis intervention," which stresses techniques for lowering the tension when encountering people with mental illness or other cognitive problems. What's not yet clear is whether the officers had the time or physical space to use de-escalation techniques, and whether the presence of children influenced the decision to use deadly force. Some of Lyles' relatives have asked why officers didn't tase her. Police sources say the officers did not have Tasers with them, but that they did have a "less than lethal" weapon, which has not been specified. As many people across America wrapped up their Father's Day activities on Sunday, protesters in Seattle gathered outside Lyles' apartment building. The crowd, which at times yelled out, "We want justice! ", held signs and candles. Lyles' uncle, Michael Taylor, spoke to them: "This is my family and we're going to be as one," said Taylor. "And we're not going to stop until we get to the bottom of this."